I'm totally obsessed with anything banana flavored (laffy taffy, banana pudding, banana bread...) and the obsession has only heightened since I've been pregnant! Which is funny because there is only a short window of time where I can eat bananas. They have to still be green and as soon as they start to have the slightest tint of brown I can't eat them anymore. I gag, literally--a little dramatic, I know. I found this amazing recipe for strawberry shortcake muffins a few weeks back on Pinterest (oh, Pinterest, what did I do before you came along?!) You can find the recipe here. I made the recipe with strawberries the first time and it was so easy, so delicious, and so healthy! We're talking 93 calories per muffin! I thought they were so good my mind started reeling with all the other fruity possibilities, so this week I tried bananas :) Yay for my first attempt at baking anything with bananas! Important: The paper liners don't work well when baking with a base that does not include flour, they always seem to stick to the paper. I sprayed the muffin tin with non-stick cooking spray or you can use foil cupcake liners or a silicone muffin pan. 1. Preheat oven to 400 degrees. Spray tin with non-stick cooking spray or line 12 muffin tins with silicone or foil liners, (or just use a silicone muffin pan). 2. Place all of the ingredients, including bananas in a blender or food processor, and blend until oats are smooth. *Important: I add the oats a cup at a time and then add the liquids. I have to stop the blender and stir a few times throughout as well. 3. Divide batter among cupcake liners, and bake for 20-25 minutes, or until toothpick comes out clean. I can't stop eating them!! Fiona- I made them with applesauce instead of yogurt and they turned out great! I also made them with honey instead of sugar! Taylor- Did you change the amount of sweetener? I am trying to not use sugar, but we have raw honey. I love your blog and this is a great recipe! I was wondering if it has more calories than the original version: strawberry shortcake muffins* or if it's the same caloric intake. Delish, Jess! Thanks for sharing! Remember the golden rule of baking with bananas: the browner the better! The spottier and more "gag-able" the banana, the sweeter and more flavorful the baked good will be! I had some turning way too brown and spotty, even for me, and knew I needed to bake them up in something. Thankfully, I remembered posting this to my Pinterest board! When they've reached the gagging point for you...wait even a bit longer and then bake them up! Or, freeze them (sans the peel) and save the baking for a rainy day. I will try with toasted, chopped pecans too! And then...blueberry muffins! Thanks again! I actually have some bananas in my freezer right now ready to be baked into muffins :) Blueberries sound really good! I may try that next... Thanks for stopping by! Delish! My only suggestion is to put all the liquid ingredients in first so that the blender doesn't have to work harder than it has too. I also added a little bit of soy milk and some vanilla extract. I did use the quick oats because that is all I had on hand and it turned out delicious. Next time I plan on adding a few chopped walnuts for a little added crunch. Thanks for sharing, this is a delicious recipe! These look great, and I was happy to see someone had success with quick oats since that's what I have handy - definitely trying these! Found your recipe on pinterest! So excited to try these! Thanks for the recipe! Tried this recipe this morning and LOVE it!!! I think I will add chopped nuts and maybe even stir in a few mini chocolate chips next time but we really enjoyed them! Made these tonight... SO easy, and SO delicious!! Just wrote this down; might go whip up a batch right exactly NOW since I have all the ingredients in the house! Thanks for sharing! Do you have to use Greek yogurt or can you use a cup of any kind? I used just regular strawberry yogurt and omitted the sugar all together since the yogurt was sweet enough. They turned out great! I've made them several times and shared the recipe with everyone I know! Found these on Pinterest this morning and whipped them up for breakfast in no time! I didn't have plain greek yogurt so I used strawberry greek yogurt and it's still so, so good! I'm always on the lookout for easy and delicious no-flour goodies. Thank you for sharing! I'm making these today with my homemade Greek yogurt. Also thinking about strawberry banana ones. I'll let you know how they work out. ohh strawberry banana sounds amazing! Could these be made into a bread instead of muffins? Mine just came out of the oven, and I poured it all into a loaf pan for a "bread". I'm excited! I used Vanilla Greek yogurt since I didn't have plain, and I only used 1 individual packet of Splenda. I don't like things too sweet, and I figured it would be perfect using the vanilla Greek. Next time, I will mix this all in my stand mixer first, and then puree it in the blender. My blender motor bogged down so badly that I could smell it burning. However, it was worth it, as I have many ideas on what to do with this mixture in the future! But for now, I will go cut off a big slice and enjoy it with my homemade iced latte, which I poured over homemade coffee ice cubes! Thanks for the awesome recipe. Has anyone tried with fresh or frozen blueberries? I haven't tried blueberries yet but it sounds delicious! I'm sure they'd work great! I believe I'll add the blue berries with the bananas, or replace the bananas with applesauce. Used 1 1/4 cup steel cut oats, 1 1/4 cut multigrain oats (both from Trader Joes) 1 banana, 1/2 cut unsweetened applesauce, 1/4 cup of honey, vanilla, cinnamon, nut meg, and the rest of the ingredients in the blender, then stirred in frozen blue berries. Got 12 large muffins, and eight mini muffins. This is a hit! May be able to use this for pancakes! sounds delicious!! Thanks for sharing :) I'll definitely have to try it! Do you have to adjust the bake time for mini muffins? I made mini muffins and large muffins at the same time...took the mini muffins out a few minutes before the larger muffins. I just made a batch this afternoon and they were a hit! My kids and husband loved them, and my husband doesn't usually like "healthy" baking. :) I definitely want to try the strawberry shortcake version too. Just wondering where you got the 93 calories per muffin from? I entered the ingredients into My Fitness Pal and it came out at 163 calories, counting 1 batch as 12 muffins. Did you make the recipe into 12 muffins, or did you make 24? Either way it's a great recipe, thanks for sharing! Hi! I got the calories off of the strawberry shortcake version. I'm not sure what the calorie count is for the banana muffins--I'd assume it'd be close to the straw. shortc. since you're only substituting the fruit. I'm pretty sure I just made 12 this time too. Thanks for stopping by! My friends made these as a "diabetic breakfast" for one of my nutrition classes, and everyone loved them! Thanks for sharing... I can't wait to try them on my own and experiment with some flavors! Oh I cannot wait to try these! Sounds like a great way to start the mornings...thank you! Is your call for Stevia for powder or liquid? I'm sorry, I have no idea. I've never used Stevia before and since I used sugar, I'm not sure. Good luck! Just found your blog through Pinterest. I'm going to try these out! Yumm!! I'm now following. Hi Thanks for posting this I love this receipe. Since I no longer cook with sugar I agree with stevia or honey as a sweetner. I added chopped walnuts and a bit of vanilla, and used 1/4 cup honey instead of sugar. Came out great. A vegan alternative is soy yogurt. I used a blueberry soy yogurt and it came out delicious! For those that do not practice clean eating. Stevia is a natural sweetner that is delicious, does not raise blood sugar or affect your liver like sugar. The meansurments are on the box. I gave this a try using 2/3 cup of pumpkin and added some pumpkin pie spice as well. Haven't eaten them yet, but the batter tasted good and they smell delicious. Can't wait to have one or two with my yogurt for breakie! Well the pumpkin ones went over great. I had to give them away at work so I wouldn't eat them all myself! Everyone at work raved about how delicious they were. And I keep getting asked for the recipe. Did you omit the bananas? Mine are in the oven right now! So excited totey them, they smell delicious. Has anyone used applesauce instead of sugar? Next time I bake these I'm gonna try it... I've done it before while baking rolls. I just don't know how much to put in!! I did 1/2 cup of unsweetened applesauce and 1/4 cup honey in place of the sugar. I wouldn't recommend it...I let the muffins bake for 30 minutes and they were still wet in the middle. I think using applesauce just makes it too dense. I'll try just regular sugar next time. Well, I'll let you know how my experimental muffins turn out, if they ever make it to the oven. This batter is delicious! I only had steel cut oats, so I blended the fire out of those first before adding other ingredients. I'm letting them rest in the fridge awhile before I put them in the oven (the fact that I forgot to preheat the oven has NOTHING to do with this information.) I used pomegranate cherry flavored greek yogurt, steel cut oats and a banana so old i could barely peel it. DELICIOUS! I'm in heaven! with a scalding tongue, but heaven nonetheless. I use half steel cut oats and half multi grain oats. Yum! These sound great. Can't wait to make them. I think I will try adding a little protein powder b/c I'm always looking for ways to add and extra boost. it made 6 large muffins and 4 reg. Instead of regular paper liners try using "If You Care" brand liners. I use them for all of my low fat or healthier version of muffins. Can't wait to try this recipe. Definitely add liquids first :) I had to transfer mine to the Magic Bullet and blend in batches but that was not the recipe's fault. I did still have to add some liquid - probably 1/2 to 3/4 cup of almond milk to get it to blend. I also used Truvia and the taste was great. Needed to cook for a lot longer but I think that's my oven. How much sweetener did you use, Lisa? Also - if you use gluten free oats this recipe is naturally gluten free. AMAZING! Whee!! Thank you! I made these tonight! They are delicious. I threw a dash of vanilla extract and some walnuts in mine just because I like it :) Yum!!!! Thanks for sharing! I made them with blue berries and they were great! I think they need just a pinch of salt but it is such an easy and yummy recipe, thanks for posting! i am wondering what the caloriie count is per muffin? I'm not sure but I know the strawberry shortcake muffins that I got this recipe from is 93 calories per muffin. I'm sure the banana muffins are about the same. I'm not someone who counts calories, I just like what tastes good and relatively healthy lol :) Thanks for stopping by! Just picked up all the ingredients to try making these myself. Looking forward to tasting them! I made these this morning and they turned out perfect. I did use plain low fat yogurt-it's what I had.I used organic sugar and also added vanilla and crushed walnuts. I made 24 regular sized muffins and I now have 12 mini muffins in the oven so I can take some to work to share. Thanks for posting this. These were so good and easy to make. I only used one banana and I added one snack size cup of unsweeted applesauce, kept everything else the same. It turned out great! Thanks for the recipe. Also, I only needed to bake them for 20 minutes. I think next time I will just blend the oats alone in the blender and add the rest of the ingredients later in a bowl (this almost killed my blender adding everything at once). Mine baked in only 12 minutes. Also, I should have let my bananas ripen even more (they were ripe, just not really mushy). Not bad, on the verge of being rubbery in texture, but overall a nice, easy recipe! Made these in my food processor with coconut plain yogurt + tofutti soy sour cream to round out one cup, and 1 1/2 big bananas instead of 2, in a mini muffin pan. I added 1/2 tsp of cinnamon, a few grates of whole nutmeg & placed a pecan on each mini muffin. My house smells divine! They are tasty but next time I will reduce sugar (to account for sugar in bananas) by 1/4 cup & add 1/2 tsp salt. Thanks for a great recipe! I'm from Brazil and I just fell in love with this recipe, love everything in it and it seems easy enough to make. Mine are in the oven right now, didn't change anything (used 2 bananas, as suggested). Hope they turn out as delicious as yours look! Thanks! Found this on pintrest and finally got to make it today! SO delish! I added a dash of iodized sea salt and a tsp of vanilla and made about 30 mini muffins. I was amazed that my hubby a bunch when he got home, because he's not a big "healthy" eater. Between the two of us, we only have half of them left for breakfasts the next few days... haha! Thanks for this and I can't wait to make them again! As I was making these my 14-month old daughter got into the pantry and handed me the Nutella so I figured what the heck and added a dollop to the batter and swirled it around with a knife. Wow, are these delicious! I also added a 3rd banana and made them in regular and Texas sized muffin tins. This recipe is a keeper! Made these tonight. Delicious! I recommend adding cinnamon and nutmeg. I used brown sugar in place of the sugar (what I had on hand) and reduced the amount to about 1/8 of a cup because I was using overly ripe bananas. I also used low-fat vanilla yogurt (again, on hand. I made these tonight, and aside from I over baked them, they came out really good! In the recipe, it calls for 1 cup of greek yogurt, is that a full cup or a 6 oz single serving cup that you buy in the store? I did a full measuring cup. I've actually just used the single serving cup--what did you think of the whole cup? I'll have to try them again with less yogurt. My guess is that the whole cup made them a little dense and just a little bit tougher. They had a chewing texture, like when you have too much liquid in bread. I'll comment when I make them again! I had no idea this recipe would be such a hit! Thank you to everyone for all the sweet comments (no pun intended ;) and suggestions for different fruit and ingredients added! I can't wait to try some of your ideas! Wish I would have known to use only a serving of Yogurt and not the full cup. A little dense but tasty. Will taste good sliced in half with sliced strawberries on top. Will make again with less Yogurt. Thanks for the recipe!! Found you on Pinterest. This looks great and I'll have to give it a shot for my MIL. I am going to make these and I wanted to clarify before I did. Should I use 6oz (3/4 cup) of yogurt or a full cup? I used the single serving of the yogurt and it tasted delicious.. I don't know if it really matters. Enjoy! Can't wait to try this. Found it on Pinterest. Just wish you had a print button! You can always hit CTRL+ P and then alter the pages in the pop up box to 1 page :-) That's how I print all of my recipes if I don't want to have my laptop in the kitchen! Just wanted to let you know - I entered this recipe into the free Recipe Calculator at sparkpeople dot com, and it came up as 193.1 calories per muffin (using 12 muffins as the yield). This was using regular granulated sugar. Still a lot less than most of the giant muffins you can buy at the store, but I wanted to let you know since that's a little over twice as much as the original recipe you adapted these from. Regardless of calorie count, these were easy and delicious! I made these last night and they are great! I used coconut yogurt in place of greek yogurt as I can't eat dairy and they came out fine. I also used half the amount of sugar and used coconut instead for the rest of the amount (I love coconut!). I also added some cinnamon as well. I made them with strawberries and raspberries and they were delish! In a convection oven, 18 min was too long and the outside burned. But the inside is good! These look good! I've made other oatmeal muffins before and I usually spray the paper liners with a little no-stick cooking spray and it works just fine! I am in love with this recipe. I made these tonight and added mini chocolate chips to have for my daughters birthday party! So good! Thank you! I have a batch of these in the oven right now! I used full fat Greek yoghurt, as the shop nearest me didn't have low fat available. They're rising beautifully and smell amazing. I made these tonight and they where great. I cooked them a bit to long, but that was my fault, not paying attention! I swear that I had bought the old fashion oats, and some how ended u with the minute ones, but it still worked out great! I liked the overall taste of these but I had a problem with the yogurt and it looks like other people did also. I do not live in the U.S so I do not know how much a serving is of yogurt, can you measure one serving and let us know? thank you. Also it seems like they need salt and maybe some vanilla, I added 1 tsp. of chia seeds. I will try these again but I will wait to see what you say about the yogurt. I originally had it posted as 1 cup of yogurt and that's when everyone started commenting about the difference between 1 cup and an individual cup. I guess an individual cup is more like 3/4 of a cup. So if you don't end up using an individual cup, use 3/4 cup from a container of yogurt and let me know how that goes. I've used the individual cup every time I've made these and they come out great. Good luck and thanks for stopping by! Help! This is the second time I have attempted to make this recipe (1st was the strawberry one you have a link to). I thought my mistake was using too much yogurt in the first batch and putting all ingredients in the blender which didn't blend very well. The muffins turned out a really weird consistency/texture in the middle and weren't that great. This time I used 3/4 apple sauce instead of yogurt since I didn't have any.....put all ingredients except oatmeal and raspberries in blender. Blended and started to slowly add oatmeal. When I had about 3/4 cup left to add of oatmeal it was getting extremely thick and not wanting to blend anymore. I pulled out the Magic Bullet which I should have done from the start because it was able to grind the oats no problem. The blender still had a hard time blending and it looked nothing like your batter in the picture! I had to add a few small splashes of milk to get the batter to even budge and then it's sooooo hard to get out of the blender into the pan! What am I doing wrong!?!?!?! I would suggest adding all your liquid ingredients first. I have an older model blender and took a couple of stirs but worked just fine. These are amazing! I made them dairy free by substituting 1 cup canned coconut milk for the yogurt. Also, I reduced the sugar to slightly less than 1/2 cup and they were plenty sweet! Thank you!! All i have right now is Quick oats. Has anyone had any luck with them or should i wait until i go shopping? Processing the oats by itself into "oat flour" first may make a smoother overall batter, it definitely will cut down on the mixing time. Your blender or food processor will last longer with no motor burn out. I've just made them!! So good and easy!! I just made this for tomorrow's breakfast and in 30 minutes, my picky son finished 3. I did not have any greek yogurt so I used activia light vanilla and even used old bananas. This is definitely a keeper. Thanks for sharing. And I used instant oats too. These sound wonderful, easy and so healthy. I am always baking something for my kids after school but I would be great with them having them for breakfast. Maybe add a little bit of ground flax seed for extra nutrition and staying power. I have my second batch of these delicious muffins in the oven now! We love them! Thank you so much for the recipe, which I came across on Pinterest. I used quick oats because its what I have on hand. They turned out well, but were definitely done baking by 19 minutes, so be sure to check them early. Thanks for the awesome recipe! I don't know how we lived without Pinterest! Can't wait to try these, just found them through pinterest. Will be using lactose free yogurt for my kiddo! Thanks for sharing! So the consistency/texture of my muffins is kind of dense-- I'm just wondering if this was consistent for everyone else. I thought the taste was great. If this is "normal" for the muffins that is fine but if I screwed something up I don't want to share my muffins lol! I made 12, so that makes each one only 110 calories. Not bad!! Made it with 8 oz greek yogurt, forgot blender (hand mixed), loaf pan, cooked for twice as long. Came out great! Thx! Made these this a.m. for my teenage son's sleepover. Quick and easy. Boys devoured them. They are dense and very filling. (6oz was my yogurt size). Thanks for sharing. I have now made these 3 times. The first time I made them with bananas & plain yougurt. Second time with fresh strawberries and strawberry Banana yougurt and just now made them with fresh peaches (white) & peach yogurt. Each time I have added a generous handful of dark chocolate chips. I think they really need the chocolate to moisten it up a bit. I wrap 2 up in saran wrap each morning and microwave for 25-30 seconds. It is my new favorite breakfast to enjoy with coffee. Thanks! What if I want to freeze these to eat later? Suggestions for microwaving time to defrost and eat on the go would be greatly appreciated! I found you via pinterest as well. 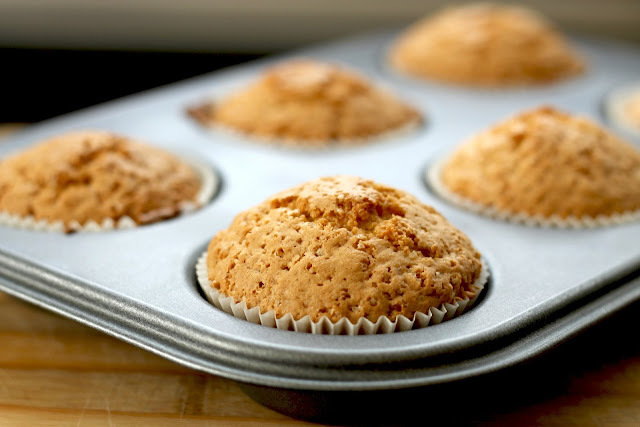 I just tried these muffins this morning because I had 2 overly ripe bananas (they were all black- and I agree, there still has to be some green on a banana to eat it plain) and I had everything on hand. They were delicious. And, by the way, best wishes for your family on your baby girl. I just had my first in April. Your life will never be the same- but in a good way! Enjoy the time you have left before Juice Drop arrives! I made these tonight, and they baked flat and dark. They were not at all light and fluffy like yours. They still taste fantastic, but do you know why they don't look pretty? I did not change the recipe at all. I'm not sure, maybe you had them in the oven for too long? Maybe! I'm not sure either. My oven is a bit finicky, it seems. I didn't have any yogurt, of any kind... but I did have a serving size of apple sauce. I also had 2 fresh apples so I peeled/diced & folded them in (wanted a fritter effect). I used only 2 tbls of splend. I added 2-3 tbls of fat free milk because it was a little thick. Next time I will put my oats in the food processor alone & then mix it all together with a standard mixer. Thanks for the awesome recipe! Disaster is in the oven right now. I have Stevia powder but have never baked with it. I used half what was suggested, 1 tbsp and the batter was disgustingly sweet and overpowering with that stevia taste. I just googled and stevia extract powder is 1tsp= 1 CUP of sugar so that was equivalent to 3 cups of sugar. Yuck I always cut sugar in half in baking so these are headed for the garbage. I also idiotically missed the eggs but did add some ground flax so I will check the texture to see how that worked but I think the Stevia killed them. :( disappointed! Oh no! I'm so sorry I didn't specify. I've never used Stevia before and I just went off the recipe from the strawberry shortcake muffins. Hopefully you can try these again using the correct amount because they are really delicious. Good luck! I used two tablespoons of stevia and they turned out delicious!! This is the perfect recipe! I love just banana bread or muffins! So excited to try this! Just found these on Pinterest and can't wait to try them out! THanks!! I featured your recipe on my blog! I made these, and I'm obsessed! I used an immersion blender, and it didn't really chop up the oats enough, so they were really dense. More like portable oatmeal bites, but I loved it! Froze half the batch and microwaved them for a few seconds for a quick breakfast. Smells just like banana bread baking in the oven! Oh, and I swapped the sugar for Stevia and a bit of honey. Thanks for the recipe! I just made these and they are so yummy! I added blueberries and used blue agave as the sweetner. The kids love them too and that's the REAL test. Thanks for the recipe and I pray for a wonderful delivery and healthy baby. Made these last night. My husband wanted to eat the entire tray! I used Splenda as the sweetener; it comes to 98 calories if you do that. I am in love with these, such an easy, go-to pre-workout snack! Made these yesterday - added walnuts and craisins and used Danon Vanilla Yogurt because that's what I had on hand. They were fabulous! Since the blender ground up the craisins really well, it was like tiny bursts of flavor throughout. Thank you for the recipe! Got distracted and forgot to add sweetener - and they turned out well! I dusted some cinnamon on top before baking which was a nice touch. Definitely going to make these again - not sure if I'll add sweetener next time, but I might have to in order to try it both way! How long did the batch stay fresh for you? Also, did you put them in the refrigerator or leave them out? A little less than a week and I left them out. Not sure how long they'd last in the fridge but I like when they are moist and soft so I haven't tried putting them in the fridge. Enjoy! Can't wait to try this recipe! Thanks! From one set of Jones' to the other, these turned out fanstastic! Light, moist and very tasty! These looked yummy, but I wanted to make a bigger batch. I was worried about burning out my blender motor with even one batch, so here's what I did to make this recipe x4. I ground the total amount of oats in my blender, 1 cup at a time. I mixed all the dry ingredients in my big mixer bowl. (I chose to only double the baking powder rather than x4) I also reduced the sugar to 1/2 cup per batch and used 1 1/2c coconut sugar & 1/2 c cane sugar for the total amount. I then beat 8 eggs in another bowl, and mixed the other wet ingredients. I didn't have enough yogurt, so I filled in the missing amount with apple sauce. I mixed the dry into the wet, added 1 bag chocolate chips to the mix and as a last minute thought, I added 4 TBSP ground flax seed. They turned out great! I am trying to be organized and get extra baking done & in the freezer before school starts and life gets busy. Most of these muffins will go in the freezer for school days breakfasts or snacks for the lunch kits, but we will keep some out to enjoy now! Is there a liquid missing? Because I've fried /two/ blenders trying to make these. I put liquids in first and as soon as the oats hit it's too much. Even if I add slowly as I did the second time the mixture becomes too dense. Sorry if this sounds dumb, I'm a beginning cook and getting very frustrated. These sounded so good, but this venture is not what I expected. Oh no, I'm so sorry you've fried two blenders in the process! And no it's not a dumb question at all because I had to experiment a little too (I'll be editing the instructions). First I add the oats slowly, a cup at a time, then add the liquids. I have to stop the blender and stir a few times too. They are definitely dense so if you're not into dense then you may want to try another recipe. Thanks for your question and good luck! My blender couldn't handle it either, but I didn't do the oats first, but I was confused by the comments =). I think next time I'll grind the oats in the blender and mix everything in my KA mixer =) Right now mine are cooking but you can still see the oats in the mix. I used 1/2 cup of honey, and found that was sweet enough. I also added vanilla and 1/2 tsp of salt. They turned out great. I have made this a couple of times the first time I accidentally forgot the sugar and they were good my sone loved the, we have made them with sugar the last couple of times.mwas going to make them today but didn't have eggs! I use a Nina blender and it blends everything very well. I just got a Ninja from my baby shower on Saturday :) I'll definitely have to try that from now on, thanks! Hi Found your recipe on Pinterest and am excited to try! Wondering if I can make them the evening before? Do they heat up well as leftovers? I made these the other day and have a post about them coming out tomorrow so please check it out! I linked back to your original recipe and just shared what I did differently so let me know what you think. Have you tried them with anything besides banana and strawberry? I used apple sauce instead of Greek yogurt like someone previously suggested. They came out yummy. Thanks. Just tried these tonight, yes they are denser than a regular muffin but they are still so yummy! I added a little brown sugar topping, made with butter and cinnamon and that is a nice sweet touch on top, if you are ok with the extra calories. I am on a gluten free diet and was very grateful for this recipe so I can enjoy some muffins again! I read your story today about your whole pregnancy experience, you are so sweet to share everything about that! How exciting and wonderful. I'm going to check back for BABY pictures soon! God bless you and your hubby and baby! This recipe rocked my world! So delicious!! I am so glad that I found it and your awesome blog! I am in the beginning stages of writing a food blog - Would you be okay with me posting a link on my blog to this awesome recipe?!? I love that this recipe is pretty healthy and simple...can't wait to try! Thanks for posting. So, I've made these muffins at least 10 times, and I've loved them every time! I add vanilla, cinnamon, and a little cup of applesauce, and they are officially my FAVORITE muffin! Also, they're only 4 pts+ each, and an excellent breakfast item! Thanks for sharing the recipe, ii made these tasty muffins today and threw in a few blueberries. Yum! SUPER YUMMY! And my kids approved! I blogged about this one! This same batter works great for pancakes also. Just top with some maple syrup. I've got everything to make these but wondering if i threw in some ripe pears if the batter would be to runny ? Hello, I have a question can the egg yolk be substitude with something or not add it at all. Or is it a most? Trying to watch what I eat and can save lots of fat just by not adding the eggs. I'm really not sure. I'm not real baker lol so I have no idea about substitutes. I know some readers have said they've used applesauce but I'm not sure if it's place of the eggs or something else. Good luck! Just made these, they are great but really dense. I added 1 TB milk cause the batter was too thick and I'm baking at high altitude (high altitude=lower boiling point and therefore quicker liquid evaporation out of baked goods). Anyone have any advice? Maybe water would make the batter more runny but not as dense? I made these on Thursday, I added 1 cup of blue berries and 1 tsp of vanilla and I only used 1/2 a cup of sugar. I mixed in berries at the end and it turned out great! I am going to make them today but doing pumpkin and chocolate chip. Thanks for this great recipe! I made these both with banana and then another batch i made into apple cinnamon. They were great! The apple cinnamon tasted like apple cinnamon oatmeal in a convenient little muffin. Its a little more dense and a little extra moist I think because of the apple.... I think if I add some more oatmeal next time it will be the perfect consistency! I was excited to try these. They looked so nice and fluffy and "healthy." But mine turned out a bit burned on the edges (even in my non-black pan) and gooey. Still good for me but my kids and husband are a bit more picky. I wonder if it is because I added the 2nd banana. It could also be due to my atomic oven. I'll turn the heat down next time. My blend-tec blender handled the batter just fine. That wasn't a problem. I think next time I'll sub applesauce for sugar, because it is so much, like others suggested. But I am still concerned about the moisture content causing them to cook too quickly on the outside and staying gooey in the middle.